Get ready for real insight to conservation and gain valuable knowledge about what it takes to preserve the future of lions of Africa; alongside getting involved with incredible wildlife activities. Lion & Wildlife Conservation is at the heart of Antelope Park. The King of the African eco-system has been declared as a vulnerable species by the IUCN. From 200,000 lions roaming the wild nearly 80 years ago (WWF Living Planet Report 2016), there has been a 43% decline in the last 25 years alone (1993 –2018), with less than 22,000 remaining in the wild (ALERT) across the whole of Africa. We are committed to finding a solution, to ensure the African Lion will always have a place on this planet. 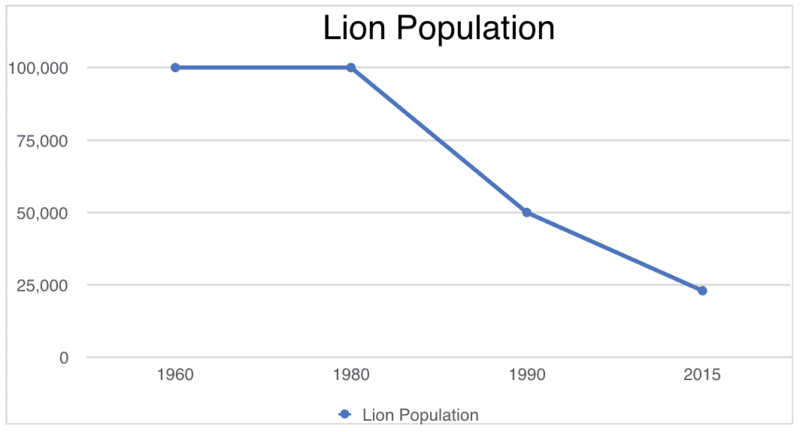 The African Lion is experiencing a rapid decline, alongside some of Africa’s most iconic animals. This table demonstrates the importance of lion conservation efforts, not only by us, but throughout the African continent. As can be seen, the lion is not the only species that is facing steep decline. Wildlife care, rehabilitation and research is a must for preserving many endangered animals and the ecosystem. There are an estimated 22,000 lions remaining today. Why Are Lions Endangered & The Threats They Are Facing? A loss of habitat: Lions have been reduced to just 8% of the land they once occupied. The reduction of their habitat also results in a decrease in prey and therefore food sources. The issue of human-wildlife conflict: Lions living outside of protected areas are open to less natural prey and therefore often turn to farm livestock as prey. In most African nations, a local’s livestock is their wealth and is usually their means of survival. Some act in retaliation by killing the lions, as a way of protecting their livestock. Diseases: In the last few years, disease has strongly contributed to problems facing the rapidly decreasing number of lions. These diseases include feline leukaemia virus, morbillivirus and bovine tuberculosis severely affecting South Africa. Other factors, including inbreeding, due to small population groups, causing genetic problems also contribute. We are proud to work alongside our trust, ALERT (The African Lion and Environmental Research Trust,) to help ensure the future of the African Lion and to implement our lion rehabilitation program. Alongside ALERT, we are at the forefront of an innovative world-first lion release program. Daily lion interactions include wandering alongside our cubs* during the day as they develop their natural hunting instincts. Take part in exciting behaviour enrichment sessions to stimulate the lions natural behaviours, down to the nitty gritty of vital care and maintenance. This rare and unique opportunity is calling you! *We will be putting a stop to our lion walks at Antelope Park from May 2019. This is so we can focus on the later stages of our release program. So, are you ready for a unique and unforgettable experience? This is your opportunity to learn about lion behaviour, their dynamics as pride and physical traits, while observing our Ngamo Pride, in their natural habitat- the African bush. Volunteers play an important role in our ALERT model, by conducting vital research on our Phase 2 lions. These lions are the off-spring of captive bred lions, who have been raised with no human interaction; living in a semi-wild release site. All the research collected moves us closer to our ultimate goal of releasing four lionesses’ into the wild. Bring out your creative side as you take part in exciting behaviour enrichment sessions, designed to stimulate the natural behaviours our resident lions, with toys made from organic materials. As an additional activity, witness how a lion’s behaviour comes to life at night. Follow our post walking lions, as they venture out, in search of their latest kill and see first hand their natural hunting instincts in practice. As an added bonus…Have you ever imagined walking alongside the mighty African Elephant? There are no other creatures on the planet as majestic or magnificent. Care for and accompany our four rescued elephants. Take a stroll through the bush in the presence of giants. Other Volunteering Activities You’ll Be Involved In. Got any questions about activities? Just ask! Why This Lion Conservation Project? A volunteering experience is one of the most incredible things that you can do and has the power to change lives in more ways than you could imagine. The work that is happening on the ground is changing the face of conservation. But our projects are about more than simply the work on the project, but also the experience beyond volunteering. Play your part in our innovative conservation efforts and contribute towards securing the future of the African Lion. Experience close animal encounters and a range of activities exclusive to us. From experiencing the chase of lions on a night encounter hunt to carrying out vital research on our semi-wild release pride. You will meet people from all over the world and create lifelong friendships, while also exploring all the best that Zimbabwe has to offer. It’s your turn to work with lions and make your footprint on conservation. But be careful not to be bitten by the Africa bug. Africa has the habit of sinking into your soul and changing your life. Alongside ALERT, we are changing the face of conservation with our ground-breaking conservation program, of which we have a plan in place to release lions back into the wild. With over 15 years of extensive research, from our highly experienced, qualified team behind it, we have full confidence that our program will succeed, and can act as a micro-model, to be implemented all across Africa. The wild-off spring of our resident lions, who have been raised with no human interaction will be introduced into secured, fenced and protected game parks. The cubs who are born to our resident lions are raised by our experienced animal handlers and are introduced to their natural habitat through lion walks, which our volunteers are involved with. 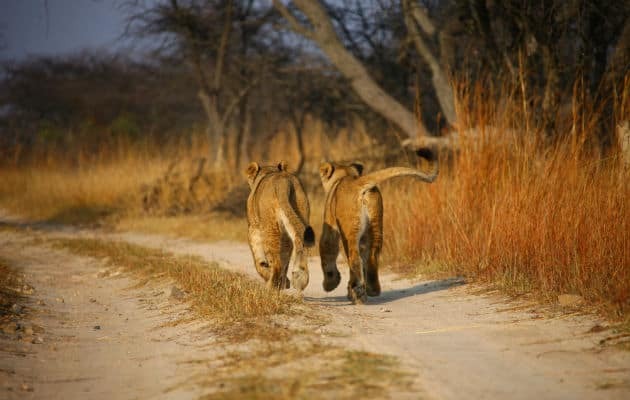 The purpose of these walks is to replicate exactly how a cub would become accustomed to the bush in the wild and to create the essence of a “pride,” to encourage the lions in natural play and to bring out their natural behaviours and instincts. In the later stages of phase 1, post walking our cubs are introduced today and night encounters; where they are free to roam the park, following a vehicle, exploring their natural instincts further. The kill rate on these encounters is a very impressive 40%. This stage of the program also provides vital income to sustain the rest of the program. It is evident to see this stage of the program is working as one of our walking cubs, Lala- Meka made her first kill, taking down an adult wildebeest on her own at 14 months old, showing that her natural instincts are exposed through these walks in their natural environments. Lions, who have participated in phase 1 of our program, are released into fenced, managed and secure semi-wild environment, where they have the opportunity to function as a wild pride, without any form of human interaction. Our volunteers are fully engaged with researching these stage 2 lions, within the semi-wild site from our research vehicle. Through conducting vital research on all forms of developments, from hunting skills to character traits, behaviours and physical traits of these wild lions. We plan to have many more of these release sites in the future, with the help of ALERT’s supporting partners to raised vital funds for expansion. Our release pride have already demonstrated their wild and natural instincts within the model release site, as they have already killed over 600 Antelope, in a pride of 11 lions. The final step for our release program. Our Phase 2 wild cubs in the semi-wild environment; following over 10 years of research of their social cohesions and stability as a pride; are translocated for reintroduction into fenced, secure and protected game parks. As part of our multi-phase program, we plan to release 4 wild lionesses into the Wild. ALERT is looking for an appropriate national park or reserve that is looking to restore the declining lion population. What is special about a lion’s whisker? The whisker spots of a lion are unique to each lion, the same way as a human’s fingerprint is unique to them. Whiskers are often used to identify a lion. What does the darkness of a male lion’s mane suggest? The darkness of a male lion’s mane is an indication of their testosterone levels, the darker the mane the higher the level of testosterone. How can you tell a lion’s age? The mane coverage, darkness of the back legs and the colour of the nose is an indication of age. Tell me something about a lion’s tail? Did you know that there is a sharp spike within a lion’s tail? This is believed to have been an evolutionary leftover trait. Why do lions scratch their claws against trees? When a lion scratches their claws on trees, it is to keep their them sharp for hunting and tearing skin and meat off. This way, their prey is an easy target. When do lion paws stop growing? Lion paws continue to grow throughout their life, very similar to how human ears continue to grow. How can cubs identify their mother? Each lion will have distinctive black marks on their ears. Cubs can identify their mothers from these marks. Like domestic cats, lions groom themselves and other lions. In time fur will build up in their throats until they need to regurgitate it. They do this by eating grass to remove the lodged fur balls. What’s unique about the differences between a male and a female lion? Lions are the only large cats where the male looks distinctively different from their female counterparts.